This is what I’ve been talking about for years. 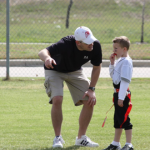 Parents all too often take the advice of coaches and have their kids specialize in only one sport…not a good idea! Let’s not even go to the obvious reason, that college scholarships are not given out to everyone. (major understatement) I’ve never said that shooting for a college scholarship is a bad thing. Just the opposite, it’s a good motivational tool. We just have to be careful that we don’t risk giving up the greatest part of the high school experience; four fun years. My greatest trepidation for kids who specialize is for when they realize that they aren’t that good. This hits these kids hard. So many of them have been programmed to believe that they are the best, and, so many times that hope gets smashed. On the long road of specialization, we make sacrifices that we can’t get back. One sacrifice is not learning how to play other sports. So, the kid that puts all his eggs in one basket now finds his basket empty. He has no other skill or sport experience to fall back on. If he ends up getting cut from that particular sport, or finds that he doesn’t love it as much as he did before, instead of being the star of the team as his parents had hoped, he has no team. Another sacrifice that is made by specializing is that you become so focused and committed to all the time requirements of practices, games and even travel that relationships with family and friends get compromised. Family meals become scarce and having time to just out with friends is rare or nonexistent. The high school years should be filled with fun and friends. But too many kids miss out on all of this because of misplaced hopes. So, great job dad in steering Brent in the right direction. 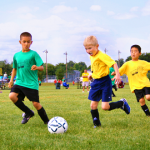 Let him experience lots of different sports, school activities, and hanging out with friends. Don’t worry; if he is talented, hard working, and is fundamentally sound, he will have a good high school sports experience. So, next weekend, go get some of Brent’s friends and have a flag football game, followed up by some whiffle ball, a big game of dodge ball, and capture the flag, ending it all with some pizza and sodas. Most of all just have lots of fun!